Upper Marlboro – Paulsboro Refinery donated a five-ton steam turbine to the Baltimore Joint Apprenticeship program that helps train future millwrights and carpenters in the construction industry. “This turbine takes our apprentices from learning about a piece of equipment from a theoretical perspective to a real-world approach,” said Bob Eaton, training coordinator for the Upper Marlboro, Maryland-based Mid-Atlantic Carpenters Training Centers Fund. “This turbine gives them plenty of hands-on opportunity for learning. Now when we use terms related to turbines, they can see the machine close-up by touching and examining it, which provides a more effective learning experience. 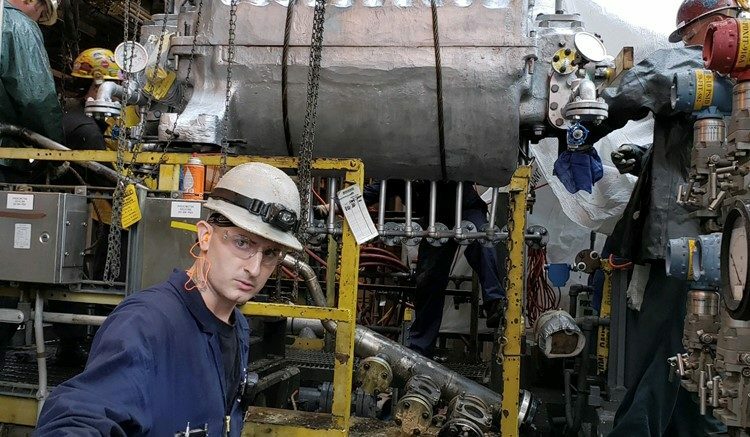 “Paulsboro Refinery is proud to donate this out-of-service steam turbine to the Baltimore Joint Apprenticeship to enhance their already well-established Millwright and Carpenter training programs,” said Kristi Moore, Community Relations Specialist for the Paulsboro, New Jersey-based Paulsboro Refinery. “This type of donation demonstrates the collaboration between Building Trade Unions and companies who seek to hire individuals graduating from these programs,” Moore explained. Miles Trengrove, a journeyman millwright for nine years and a member of Millwright Local 715, who is a contract worker at Paulsboro Refinery, helped coordinate the transfer to the Upper Marlboro training center Feb. 13. “The turbine was a useful piece of machinery at the refinery, and we were fortunate to have the company donate it to us after they upgraded to a more efficient turbine,” Trengrove said. Millwrights are highly skilled craftsmen, who disassemble, repair and reassemble machinery in power plants, refineries and chemical plants, factories, mills and other industry-related projects. Paulsboro Refining Co. is a subsidiary of PBF Energy (NYSE:PBF), one of the largest independent petroleum refiners and suppliers of unbranded transportation fuels, heating oil, petrochemical feedstocks, lubricants and other petroleum products in the United States. The mid-Atlantic Carpenters’ Training Centers (MACTC) has conducted carpentry training programs for Maryland, Virginia, and the District of Columbia since 1951. Students in this program are on a career path that promises good union jobs with superior health benefits and retirement pension plans. The MACTC apprenticeship is a four-year program consisting of on-the-job training and related school-based instruction. Our carpentry students are employed by union construction companies and earn some of the best wages in the industry. MACTC Apprentices earn while they learn. Be the first to comment on "Paulsboro Refinery Donates Steam Turbine to Labor Union’s Baltimore Joint Apprenticeship Program"